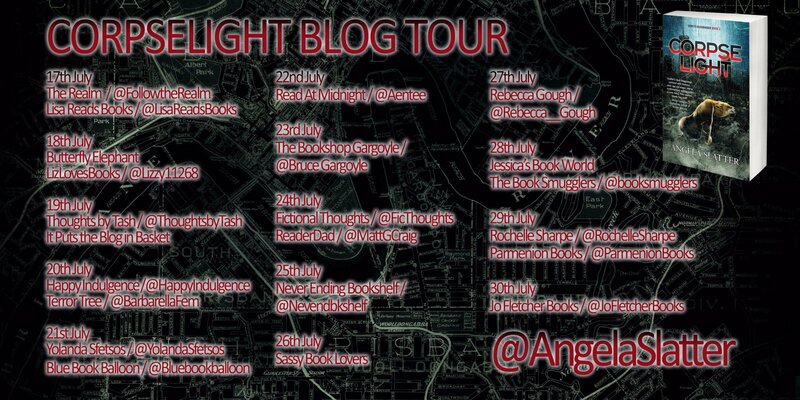 ← Corpselight by Angela Slatter – the blog tour. The first thing I want to know about sequels is ‘Should I read the first book before I start this?’. In this case, the answer is ‘Yes, definitely’. Whilst there is some recapping of our hero’s history, it’s not in depth. There is so much character development and continuation of previous plot lines that it would be a pity to have not read ‘Vigil’ before starting ‘Corpselight’. Fassbinder is one of a select group of people who are aware of the presence of supernatural beings in Brisbane, they are tasked with keeping the peace to protect both the human and the non-human (Weyrd) population. Her role is a very particular one, as a half blood, she lives in the human world, and that of the Weyrd, and has very useful connections in both. She’s basically a gumshoe detective with extra powers. She’s got a dark back story, a long to-do list, and super strength. Well, she HAD super strength back in Vigil territory. In this second book, she starts the story heavily pregnant, and her only supernatural power is a very sensitive sense of smell. Her sense of humour and instinctive aggression haven’t changed though. This sequel follows the same structure as the first book, with Verity charged with solving several crimes against or by the Weyrd, and trying to do her job whilst protecting those that she loves. In this book, at first those are her boyfriend, then her newborn baby, then she acquires even more family members to worry about. The theme of motherhood is very strong, and is entwined with the underlying series theme of murdered children and the culpability of their killers. We get a lot more of Verity’s back story in ‘Corpselight’, and most of it is revealed to us at the same time that it’s revealed to Verity. Those revelations have direct and interesting consequences for most of the characters in the book. 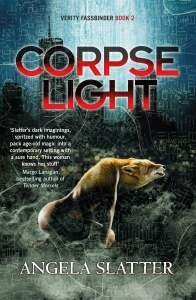 ‘Corpselight’ definitely has the feel of a middle book, and I look forward to being hurled into the third book and the conclusion of this enjoyable series. Thank you to the team at Jo Fletcher Books for the review copy. Vigil is available in July 2017, from Jo Fletcher Books. 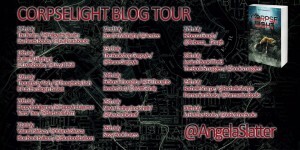 This entry was posted in Fiction, Review and tagged angels, Australia, Brisbane, Review, Slatter, Wyrd. Bookmark the permalink.